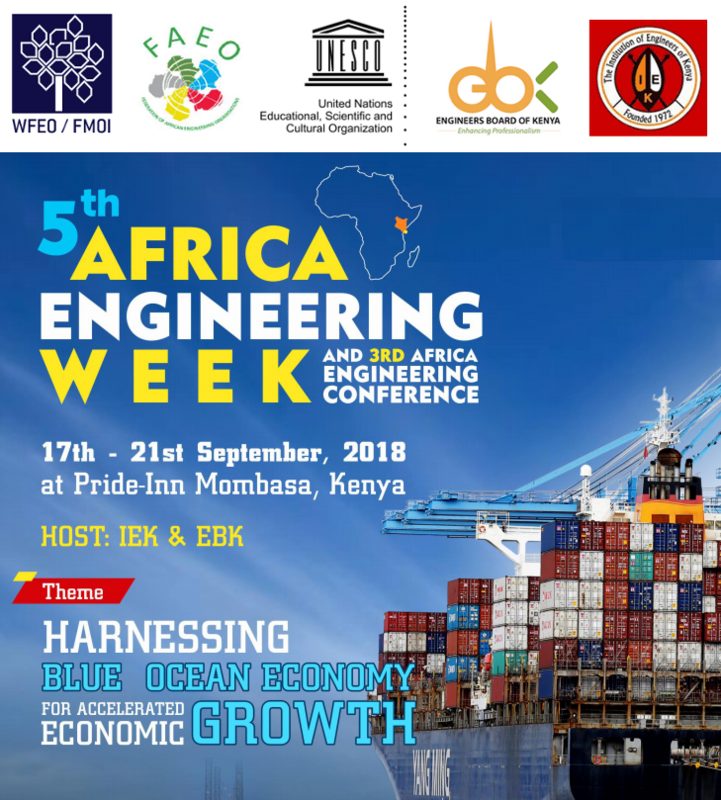 The Institution of Engineers Kenya in collaboration with the Federation of African Engineering Organisations (FAEO) hosted the African Engineering Conference in Mombasa, Kenya, between 17 and 21 September, with the support from UNESCO and guidance from the World Federation of Engineering Organisations (WFEO). The Theme of the Conference, “Harnessing Blue Economy for Accelerated Economic Growth”, is in line with the United Nations Sustainable Development Goal No. 14 on life in the sea. The Conference registered over 650 participants from 17 countries, therefore making it the largest Engineering conference ever held in Kenya. Dr. Marlene Kanga, WFEO President, could not physically attend the event. Consequently, she mandated me to attend and deliver a keynote address on her behalf. 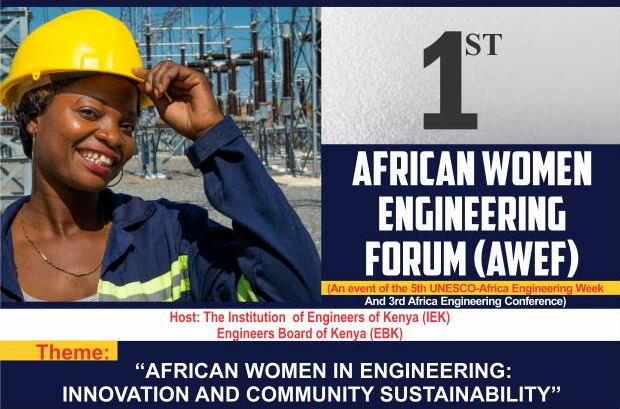 A whole-day 1st African Women Engineering Conference was organised by the Chair of the WFEO Women in Engineering Committee, Engr. Valerie Agberagba on 17th September 2018. The Conference registered 107 Women participants from 8 countries. Various papers were presented on various topics ranging from engineering to leadership, gender balance entrepreneurship, capacity building and mentoring. Capacity Building Workshop was launched as directed by the WFEO President, by Prof. Yashin Brijmohan, the Chairman of the Capacity Building Committee of WFEO. He was assisted by leaders of various Engineering Institutions as well as the senior engineers from the Academia. Ethics and Transparency workshop was also held, led by the Chairman of the Anti-Corruption Committee of WFEO, Eng. Martin Manuhwa. Mentoring of a total of 560 students of various Secondary Schools from the Mombasa County by the leadership of the Engineering Institutions with a very strong support by the UNESCO Regional Office representative, Dr. Alice Ochanda. The selection of the students was made to have equal number of boys and girls. The resolve by the Engineering Institutions present to support WFEO in its bid to get the UNESCO approve the proposed World Engineering Day for Climate Change Action and Sustainability. FAEO will circulate information to all the Engineering Institutions, Regulatory Bodies and Academies of Engineering in Africa to get the support letters. As Advisor to WFEO President on Africa, I will make the necessary follow-up. The Federation of African Engineering Organisations (FAEO) also held its 3rd Quarter Executive Council Meeting on 18th September 2018. At the end of the conference, Resolutions as well as Mombasa Declaration were written and signed by the relevant stake-holders as attached with this Report. While acknowledging some challenges with the organisation of the Conference especially at the pre-conference period, the WFEO delegation (Yashin Brijmohan, Martin Manuhwa, Valerie Agberagba and myself) worked very hard to straighten issues during the Conference, in order to register success. quality of the presentations, number of participants, nationalities represented, Women in Engineering programme and Mentoring activities held, the Conference can be said to be successful. The Mombasa Declaration on Harvesting Blue Economy for Accelerated Economic Growth, agreed by WFEO, the Federation of African Engineering Organisations, UNESCO, and the Institution of Engineers Kenya, was released on Sep. 21, 2018.